On display at the booth of Versatility Professional Tool Storage, LLC, Alsip, IL: turret-press and press-brake changeover carts, productivity-enhancement tools inspired by lean-manufacturing principles. The cart's ergonomic design speeds setups by staging and organizing tooling, increasing the user's green-light time. 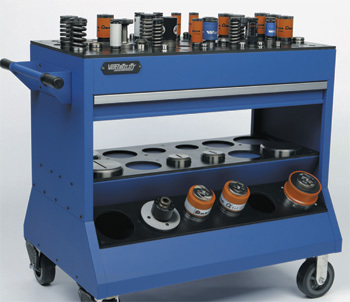 A protective polyurethane liner protects dies and guide assemblies, and a drawer organizes instruments, shims, wrenches and other tools and keeps them close at hand.